The Beatles, football, the docks and hard graft are what Liverpool is best known for. But since 2008, when Liverpool was the European Capital of Culture, this city has had a few more of its facets shined up and revealed to the outside world. In amongst the building work you'll find some of the best places to stay in Liverpool, honed from what were previously industrial or commercial premises. Before 2008, Liverpool was already shining up its city centre. A centre which has always been blessed with more listed buildings than anywhere but London. To that buffed up centre came the museums and galleries, restaurants, cafes and bars, which now make this a fascinating, as well as nice looking, city to explore. One of the great things about Liverpool is that the architecture makes just walking around an interesting experience. St. George's Hall on Lime Street is considered by many to be one of the finest neo-classical buildings in Europe, St. Nicholas and Our Lady Church is an impressive local parish church and the area around Albert Dock has the largest collection of Grade I listed buildings in the UK. If you direct your strolling towards these sights you can ensure seeing the highlights. It's worth taking a ferry across the Mersey to explore the Albert Dock area. This is where you'll find the Tate, the Maritime Museum and The Beatles Story Museum. If you are on a Beatles pilgrimage some of the best places to stay in Liverpool are around the Cavern Quarter. Which is also a good location if you're here for the shopping! Cavern Walks in the Cavern Quarter is where you'll spy all the premium boutiques and where most likely to spot a WAG. The area around Lark Lane is one of the best places to stay in Liverpool for foodies. this is where you'll find many of the top eateries. If you're here for the nightlife try the area around Seel Street, recently voted the fourth 'Hippest Street' in the UK. Visit the beautiful early 20th century Liverpool Cathedral. Be sure to stop at The Beatles Story, the world’s largest permanent exhibition devoted to the lives of the Fab Four. The collections at the Walker Art Gallery has works from the 13th century to present day and is definitely worth a visit. Catch a performance at Echo Arena which stages comedians, live music events and sports. With so much going on many of the best places to stay in Liverpool are quickly snapped up, so to be sure of a booking make your plans and book soon. 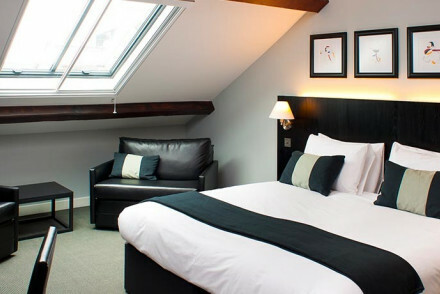 For chic minimalism in the cultural quarter book the Hope Street Hotel. 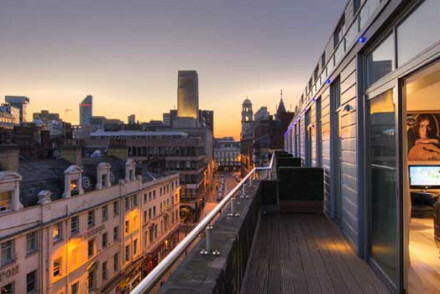 One of the city's first boutique hotels and still one of the best places to stay in Liverpool. The Hope Street has a well respected restaurant and a popular cocktail bar. 62 Castle Street is Victorian and grandiose on the outside, right in the heart of the old banking district, and kind of modern Art Deco on the inside. 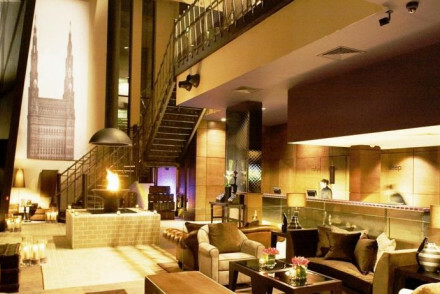 Malmaison, Liverpool is right on the waterfront where all the action is. A classic Malmaison offering with the carefully chosen decor and good service you'd expect from this chain. The Titanic Hotel, located in a converted warehouse, is a fantastic celebration of the world's most famous ship. With original brickwork and vaulted ceilings the rooms are stylish and comfortable. The Hard Days Night Hotel is billed as the world's only Beatles inspired hotel. Close to the Cavern Club where the fab four rose to fame, in an elegant Grade II listed building. As well as being decorated with an impressive collection of memorabilia, the hotel has a 'Blake's' restaurant, named from the artist Sir Peter Blake who designed the cover of the Sergeant Pepper's album. 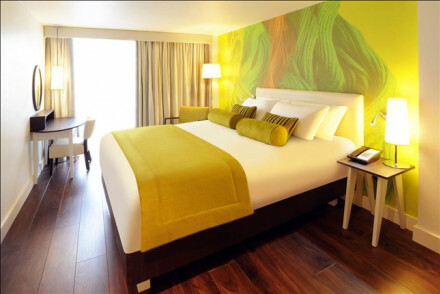 Hotel Indigo offers funky, multi coloured design close to the vibrant waterfront and Albert Dock. You'll also find a Marco Pierre White steakhouse and the Cotton Lounge for cocktails and bar food. The Racquet Club was built in the style of an Italian Palazzo in 1857 by a wealthy merchant and its decor is now a happy blend of modern art and traditional furnishings. The restaurant is award winning and there's a library, gym, snooker table and squash courts. 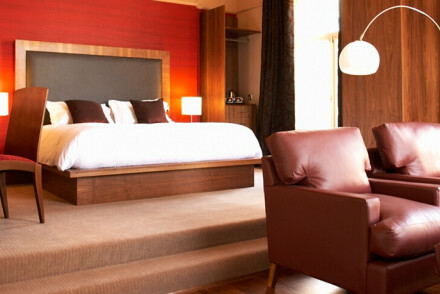 Parr Street Hotel has been created within the iconic Parr Street recording studios, frequented by Genesis and the like. 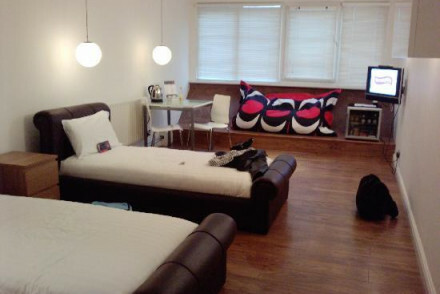 Double PodZzz starting from only £49 per night. Another great value option is The Nadler. Centrally located just moments from the vibrant Ropes Walk area and close to some of Liverpool's main shopping destinations. 2 Blackburne Terrace is a gorgeous restored Georgian mansion located in Liverpool's city centre. Offering luxurious and elegant accommodation complete with Egyptian cotton linen and antique furnishings this property is a true hidden gem. Fly to Liverpool John Lennon Airport which is well served from within the UK and Europe. The larger Manchester Airport is just an hour away and there are good public transport connections. By train, Liverpool is well served by frequent rail services to/from Birmingham, Leeds, London, Manchester, Newcastle, Nottingham, and York. Best time to visit - Liverpool is a year-round destination with each season offering its own charm. However, for the best chance at warm bright days travel in the summer months of May - August. Browse through our list of all the best places to stay in Liverpool. Widen your search and view all our recommendations in Lancashire. Once owned by Genesis, these iconic recording studios, the biggest outside London, now house a cool, contemporary, funky hotel. Bang in the middle of bustling Liverpool, there are still three recording studios and the Attic bar in the same building. Bedrooms are well equipped with the necessities. Best family value in Liverpool in the city centre in a UNESCO World Heritage Site. Smart comfortable ensuite rooms, from singles to suites. 24 hour concierge, friendly, helpful staff, room service breakfast only, just moments away from bars and restaurants of the vibrant Ropes Walk area. Boutique hotel in the old banking district of Liverpool. A splash of contemporary art-deco amid business chic decoration. Gourmet restaurant. A small hotel in the heart of Liverpool and just a few steps from the famed Penny Lane junction. Simply dressed rooms are light and airy with white-washed walls and heavy pieces of furniture - the best have four posters. A lively bar invariably celebrates the Beatles. A good city base. 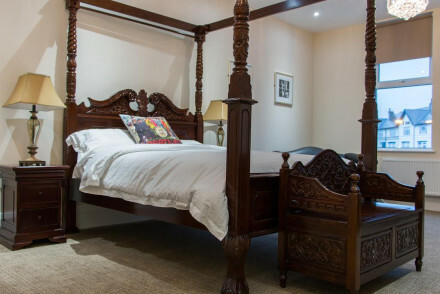 Local exploring - Located in the Mossley Hill area and surrounded by a number of Beatles attractions as well as access to the rest of Liverpool. Sights nearby - The impressive Liverpool Cathedral is worthy of a visit. 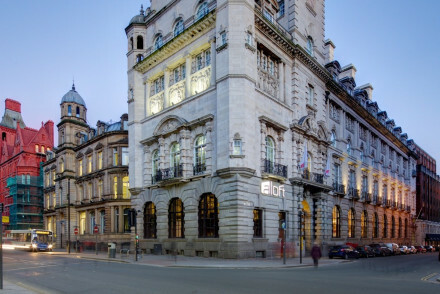 Superbly located, Aloft Liverpool features swish contemporary rooms in a gorgeously traditional building. The restaurant and bar give off a definite New York-style vibe, and you're just minutes from the sights. A terrific choice! Value chic - A terrific stay at a great price! Bill Shankly is a name so synonymous with Liverpool and football in the city that they've made a hotel in tribute to him. 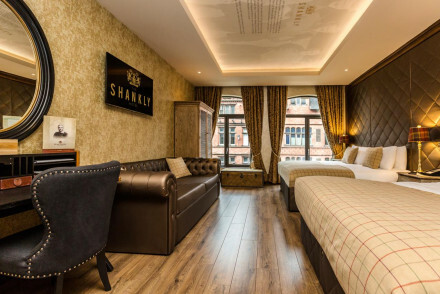 Smart and sleek, The Shankly focuses on providing comfortable rooms in the heart of the city. There is a superb restaurant and the bar is bustling. A must for fans of the Kop. Sights nearby - Wander around the nearby Cavern Quarter made famous by The Beatles. Right in the heart of this thriving city, the purpose built Malmasion is situated on Liverpool's historic waterfront. The winning formula of comfort, good food and excellent service is much in demand with a loyal clientele. Well-appointed bedrooms from standard to suites. Smart bar and brasserie. Billed as the only Beatles inspired hotel in the world, this 'Fab Four' star stylish hotel is housed in the elegant grade two star Central Buildings in the 'Beatles Quarter' of the city. Next door is the famous Cavern Club where the Beatles rose to fame. Beatle memorabilia and Beatle mania rules. 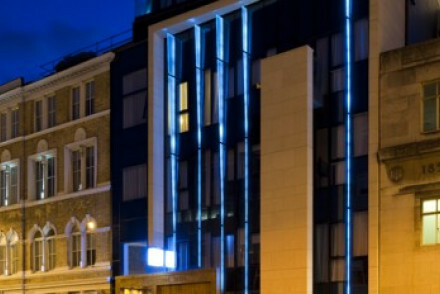 Utra funky, multi-coloured 4 star boutique hotel with Marco Pierre White grill. 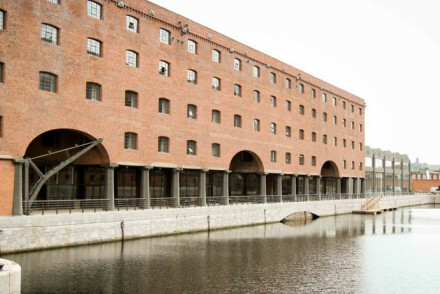 Built on the site of a cotton warehouse and close to the historic and vibrant waterfront, shops and Albert Dock. Bold designs, contemporary bedrooms, cool gym and not to be missed is the signature Cotton Candy Cocktail! Built in the style of an Italian Palazzo in 1857 by a wealthy merchant, and then used as Gentleman's Club. Centrally situated, and now a family run institution with an award winning restaurant Ziba. 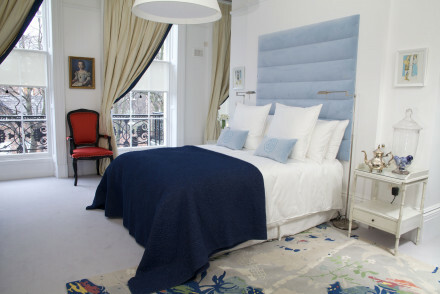 Contemporary original art is mixed with traditional furnishings, bedrooms are beautifully appointed. Formerly at the heart of Liverpool's industrial output, this warehouse come hotel is a fantastic celebration of the world's most famous ship. With original brickwork and vaulted ceilings, the rooms are stylish and comfortable. 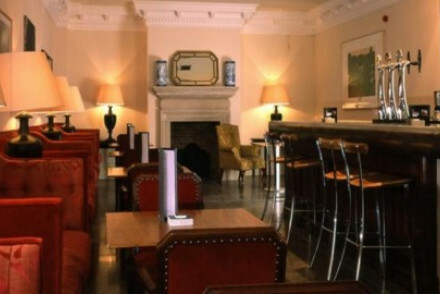 Enjoy an evening cocktail in the atmospheric Stanleys Rum Bar. City Style - A quirky and fun designer hotel, in the heart of Liverpool's docklands, with immensely spacious rooms and a funky rum bar. Sights nearby - Though you may feel completely cut off, the hotel just a short and beautiful walk from the Pier Head. 2 Blackburne Terrace is a gorgeous restored Georgian mansion located in Liverpool's city centre. Offering luxurious and elegant accommodation complete with Egyptian cotton linen and antique furnishings, this property is a true hidden gem. Feel like a VIP at this first-rate option for a city break! Contemporary minimalism in the cultural quarter of Liverpool. The city's first boutique hotel. Renowned restaurant with modern international cuisine.